KE4KE | Comments about computers, amateur radio and whatever. I realized the other day that an update is overdue. The desk now has a TS-590s and TT Eagle with a few various keys. The Czech key is still my favorite. There is now an interface box for feed lines mounted on the outside of the house, only one empty slot remains. Antennas include a G5RV and 20 meter folded dipole, both at about 40 ft. The tall trees in the back yard are nice and tall. They are also a challenge since there are 13 of them in a very small space. There is also a 4BTV on the roof, but it may get moved if the shielded speaker wire does not help with RF in the TV audio system. Other antennas include a 2/440 vertical, 6 meter horizontal loop and a 220 yagi. Still to add is a two meter yagi for CW. I intended to publish this before Huntsville. Oh well. Comments are added after the hamfest. Hamfests are a lot of fun. It is great to look at a lot of the items that people bring to sell. It is sometimes a walk down memory lane. At larger hamfests it is very helpful to be able to see and learn about new equipment. If you have a plan you can sometimes take advantage of better prices. So I have a plan. 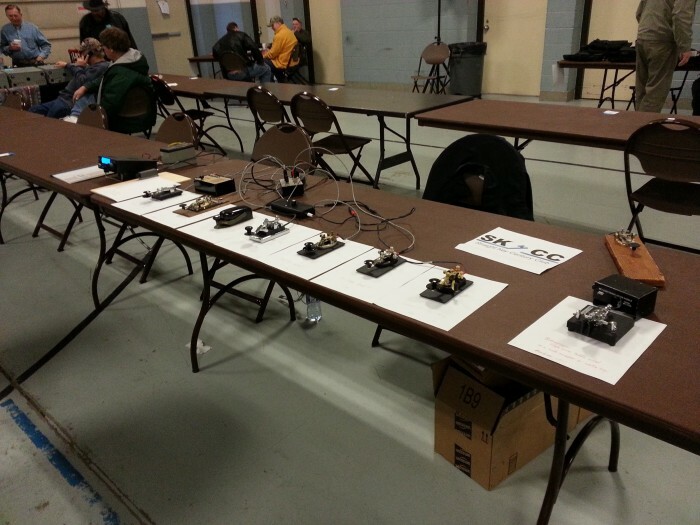 We’ll be attending the Huntsville Hamfest this month and I am making a list. Hamsticks are not expensive until you add shipping. I need to replace the old original Lakeview Hamsticks that are becoming intermittent. I’m not sure how many more times I can resolder them. I’ll need one each for 20 and 40 meters and the quick release connectors as well. I am short one. Bought the antennas, found the missing quick release. Probably need more though. On the list are also items like an 8 pin mic connector, got it, SO-239 threaded barrel, got it, and a 24 hour clock for the vehicle, still looking. The might get list includes a DC power strip, Bridgecom 220 MHz rig and an LNR MTR-5b. Hehe, yeah, we’ll see. Nope didn’t get any of those. I have been doing a lot of reading and watching videos on D-Star, DMR and Fusion. I plan to get a Fusion 2/440 radio, got it, may get another. Maybe I’ll get a D-Star radio, but will probably wait till or if Kenwood releases a mobile? Didn’t get the D-star. There is no plan to buy a key. I suppose that if someone was selling a good condition Begali Blade I might have to grab that. N3ZN will be there so I might have to try out the ZN-HK straight key. I tried out several of his really nice keys. At $350 for the straight key it is on the back burner. I did buy a bunch of 450 ladder line. I need to replace the line on the G5RV. Got a hat with my call sign and we are good with Hamstick antenna mounts for the next few years. I did manage to get all of the little connectors and parts that I had on my list. The wife replaced her old call sign sweat shirt. Saw people we know which is always super. On the way down I made several SKCC CW contacts. The first guy I talked to met us at the Hamfest. Then on the way back up here I had a contact with a friend of his who knew about our meeting. Pretty cool. There will be some spare time and we are even planning on some fun at the Von Braun planetarium, that was interesting, and the Space and Rocket Center. The Space museum was good, but I have to say that it was a monument to our past. Other than the space station which is great, we have little going on at the moment. We are having unusually pleasant weather for March in Minnesota, 66f. Took a short bike ride up to Rivers Edge park at the north end of the block I live on. 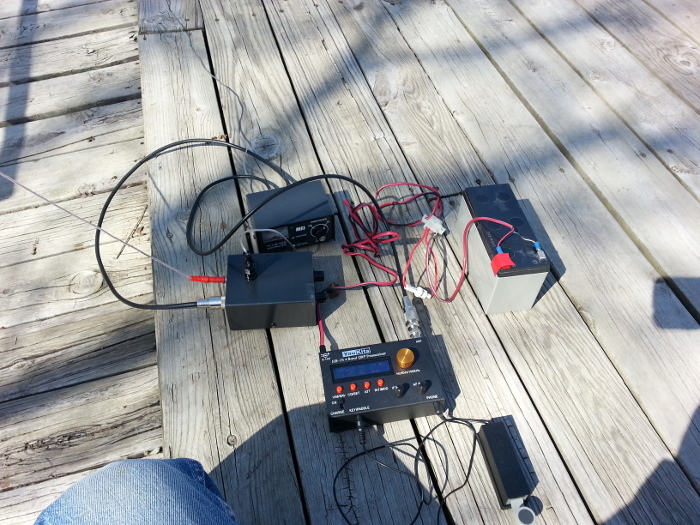 Made seven contacts for SKCC WES this afternoon with the MTR3B and about 35 feet of wire. I have been on vacation this week. Yesterday I was reminiscing about operating outdoors this last summer. That was one activity that I just did not get enough of this last summer. 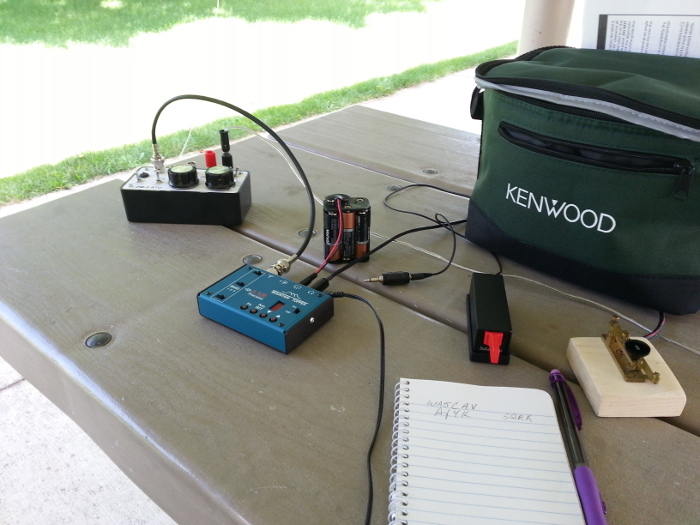 I read the blog posts of W1PID and his friend W3ATB now and then as they report on their outdoor QRP portable operating. I still have yet to make a contact with the Mountain Topper. Normally it would not have been my style of radio, but I do really like it. It is easier to use than I had thought. So stuck inside a third floor apartment with -24C outside and nothing much to do I suppose this just made sense. 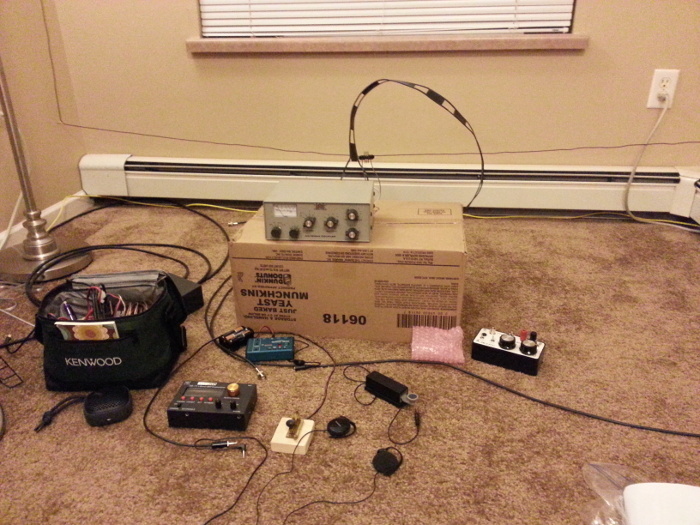 I strung a wire loop antenna at the end of the room that has the outside wall. 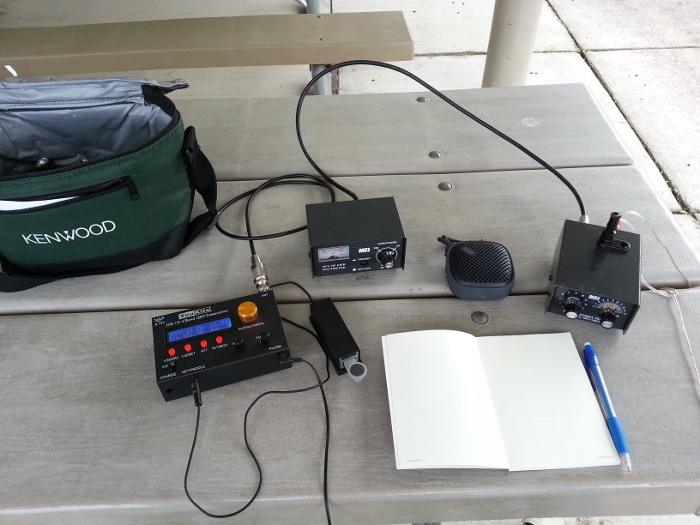 Using an MFJ-250b I was able to tune it and listen around on the two radios. I did remove the ladder line and added a balun. This last summer I made several contacts with the HB-1B and I very much appreciate the variable IF filter. The noise level here is pretty high, but I do hear good signals and have made contacts with the desktop radio. I’ve almost always owned a QRP radio over the years, but never one that could truly be called trail friendly. During the winter after looking at the KX3 I decided to purchase YouKits HB-1B radio. It is a four band, 80-20 meter, 5 watt, CW radio. I’ve had the opportunity to set up outside a couple of times this Spring. So far what I have been doing is taking along a wire that is, I think, about sixty five feet long, a counterpoise with a small MFJ tuner and Power-SWR meter, a straight key, earphones and SLA type battery. The first outing was just out in the courtyard at our current apartment complex. The Wisconsin QSO party was in progress. I made six contacts to Wisconsin and one SKCC contact. The next time was at the Bob Cross Nature Preserve in Sauk Rapids, Minnesota. That is just across the Mississippi river, three miles from home. 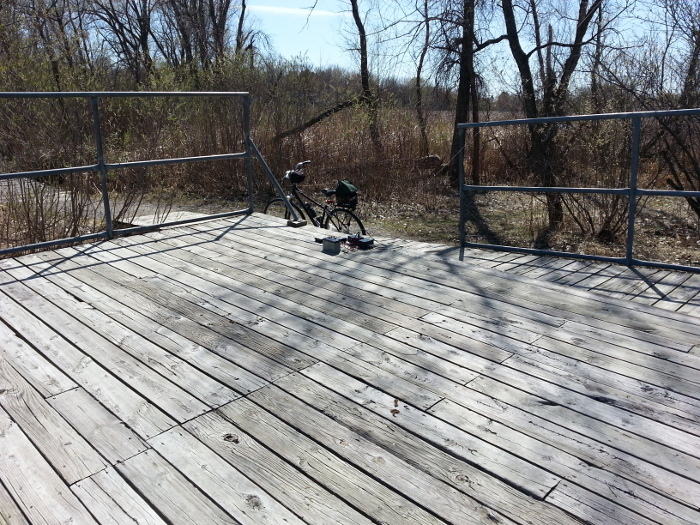 It was a part of a bike ride so I made one contact to Oklahoma for SKCC. 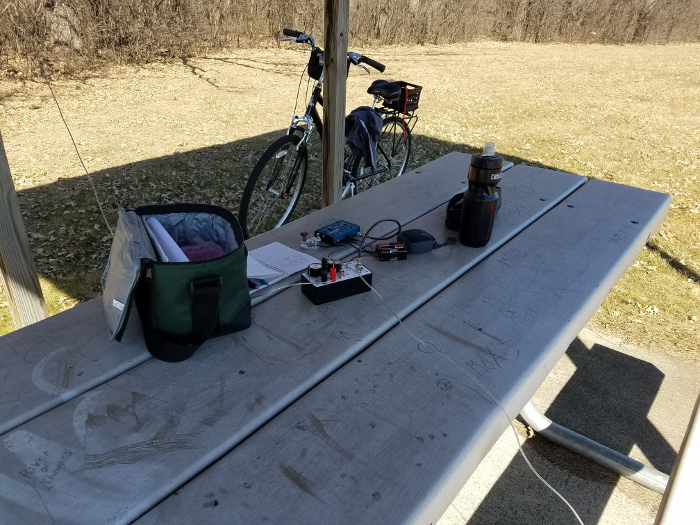 I’m hoping to have some fun combining two hobbies this summer, bike riding and ham radio. I’m going to have to get a smaller battery though. The 7AH batteries are pretty heavy on a bike. Just adding that my next ride was 3 miles the other direction and I just used the internal battery. Two contacts, New York and Detroit. The last couple years I missed the Brainerd, Minnesota hamfest. They changed the date a few years ago so I finally caught up. At a previous hamfest I met a couple hams promoting the Brainerd hamfest and asked them if they would provide a table for a CW demonstration. So with their encouragement I went and set up a demonstration of several straight keys. I took two code oscillators along with a way to plug in several keys at the same time. The straight keys included: Bencher RJ-1, JJ-38, Czech key, Chinese Military key, and three variations of the Nye Viking Speed-X key. On the far right was a Bencher ST-1 single lever key wired as a sideswipper or cootie key. The sideswipper had it’s own oscillator. The JJ-38 is a Japanese version of the J-38 key. The Ameco K-4 key is also a type of J-38 that was sold at Radio Shack for many years, but is not currently available and it is unknown if it will be made in the future. At this time there is only one Speed-X key available. On the far end was a Ten-Tec Argonaut VI with Palm paddles. The Argonaut served as the oscillator for the paddles, but was mainly there for show and tell. The Argonaut happily replaces an Icom IC-703+ that I recently sold. On the way to Brainerd I chatted with another ham on 146.52 MHz. 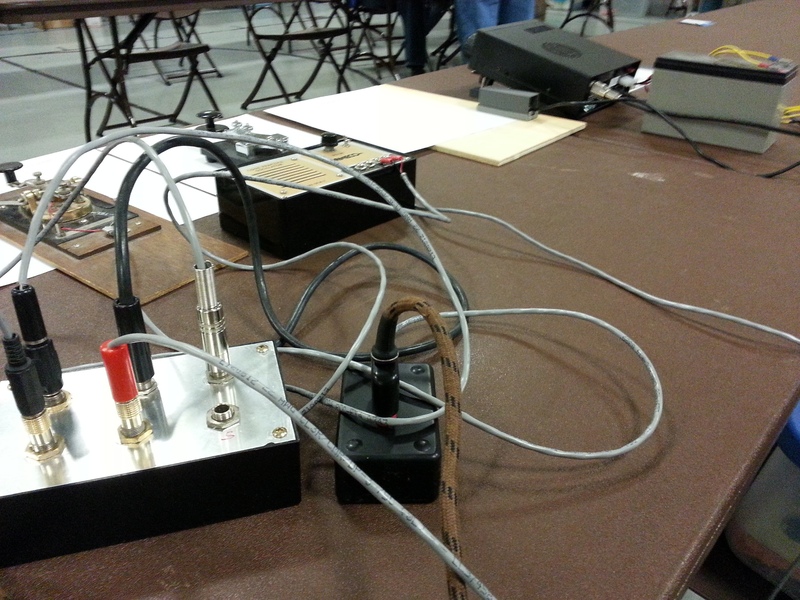 During the hamfest he brought and showed me his KX3. It’s a very nice radio and if there had not been some unfavorable comments about it’s QSK I might have been tempted to buy it instead of the Argonaut. To make this happen I bought and built a T-Tone pure sine wave code oscillator. (link) That is the small black box in the middle. There is also an Ameco code oscillator. (link and link) I rewired the Ameco oscillator with a power switch to keep the oscillator running and reduce the chirp. Keying is now accomplished in the speaker circuit. Connected to the Ameco oscillator is a box with six 1/4 inch jacks to plug in keys. I had those in my junk box, but had to go to the plumbing area of a hardware store to get nuts. I used a splitter to get two keys plugged into the T-Tone kit oscillator. The T-Tone has a bit more volume and does not use a 555 timer chip so the waveform is not a square wave. Since some radios use 1/4 inch jacks and others use 1/8 inch jacks for key or keyer input. I typically just wire all keys with a 1/8 inch plug and add an adapter. I set both oscillators for about 700 Hertz, but let them both be a tad different so you could tell which was which. So several people came by and tried out the keys and talked about CW, straight keys and the sideswipper. One guy actually knew how to use the sideswipper. It’s going to take a while for me to get it. Several taught me something that I didn’t know about some of the keys. It was a good opportunity to promote some of the CW organizations. I had an SKCC sign, but mentioned FISTS a few times. It will be a long time before I could become a member of the CW operators club, if ever. A few people checked out the Argonaut. Everyone who came by seemed to appreciate the display and the opportunity to get to try out the keys. I’ll be doing this again. As I have mentioned in pasts entries I can not operate from my RF noisy apartment. I do now have an IC-703+ set up and monitoring 28.05 MHz, 52.525 MHz and 50.081 MHz with the idea that I might participate in some local CW practice. I have heard one station, amazingly enough one from Hawaii, on 28.05 MHz, but as I type this the signal meter reads S5-7 noise on all three frequencies, usually it’s S7+. So most of my operation is in the car or from the apartment remotely operating a radio 35 miles away at work. Recently I received an email asking about my remote operation. Since I have never really explained how I do this and how it works in one post I thought this would be a good thing to do. Here is how I do it and how I made it work for me. The radio I use is the Kenwood TS-590s. I use and prefer to use all Kenwood software. So I use the ARCP-590 and ARVP-10R in the apartment. ARCP is for control and ARVP is the audio VOIP. At work I have a Windows machine that is hooked by RS-232 cable to the rig for control. I avoided using a USB connection due to lag and issues with Windows dealing with a USB port for audio and control. There I have the ARHP-590 and ARVP-10H running with VNC. VNC is used just so I can get in and adjust audio levels, restart software or the computer if really needed. On this end I have a Plantronics headset. On that end I use the speaker out and the line in ports to a couple of in line transformers then the ACC2 port on the radio. I use a 1:1 transformer for the rig audio out (ACC2) to the computer line input. I use an 8 ohm to 500 ohm transformer to go from the computer audio out to the Audio in pin on ACC2. This prevents ground loops and hum. I just retired an old Pentium 4 computer on the radio end. That is too slow for the audio. One could use a much older computer for control, but with the Pentium 4 the audio, both receive and transmit, would cut out about every ten seconds. An even older machine I tried once had even worse audio cut outs. That was still the case with me going into Windows and maximizing RAM, etc to favor audio. By the way I have Win7 on the apartment computer and Win8.1 on the rig end and they work fine. With a pair of the Remote Rig boxes I could run CW with this setup and drop the need for a computer on the radio end. I have been a bit skeptical of that, but will probably eventually try them. So what do I think about how it all works? I think it’s great. 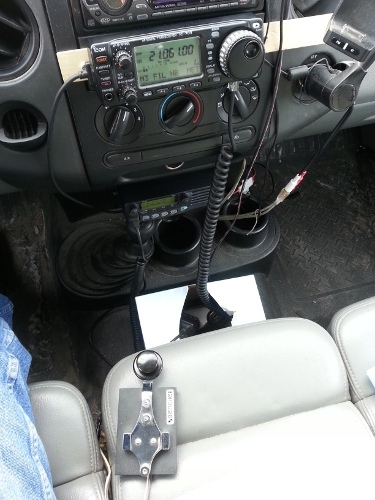 It beats not operating or having to drive into work anytime I want to use the radio, which is not always possible, or sitting out in the truck with the Kenwood TS-480sat and a Hamstick antenna. I went out to the truck in -17 degrees to work a couple SKCC contacts for the K3Y event last month. One recommendation. As I mentioned I use a Windows machine to access the radio at work. I have a second computer, an iMac exclusively running Ubuntu Linux that is used to run the N1MM logging software and occasionally check a contact on QRZ. One can use just one computer, but I highly recommend using one computer for control of the rig and another computer for everything else, logging, QRZ and whatever. When I first started doing this I can’t tell you how many times I went to hit transmit (I have it as F2) and the control software was not the active window because I was trying to log or look at QRZ. This was very frustrating and it really slows down one’s contact rate. So it is best if you can dedicate a machine for radio control. By the way don’t forget to set the radio time out timer to on. It is rare to lose internet here, but it has happened during three contests in the past two years. Just a quick note about Field Day. Between storms and work I only got to operate a few hours Sunday morning. We actually lost power at the apartment for 42 hours. I operated 1C from the truck waiting at work for the power company to arrive and repair a line and pole damaged by lightning. I operated CW with stations running 20 to, well much closer to 25 words per minute. I use a straight key, but I have paddles set up to practice sending at 25 wpm and I was able to match their speed, off-air of course. I can not actually send that fast. I made 19 contacts. In more recent years the CW I have heard during FD was just too fast and I never found anyone slow enough for me to try to copy. Calling CQ never netted any results. The good news for me is that they didn’t sound all that fast to me. Maybe I am improving! I still can’t copy a normal conversation that fast, but for FD where all you are looking for is the number of transmitters, class and section, the worst part then is just getting the call sign and that has been much easier. By the way, I did hear some slow CW so some one who is just getting started may have some fun as well. It was great fun even though only for a short time. The main problem I have had here has been finding a good place to operate for FD. The last few years the weather has not been very helpful. That is the reason I did not set up and operate this year. Perhaps next year will work out better. Perhaps I will operate with some others next year? I have been practicing Morse code on and off for the last several years. Most of the time has been driving in the truck listening to some very old cassette tapes that were given to me back in the 80’s. I converted them to MP3 files years ago and have kept them on my audio player. Also I have left the HF rig or one of the online WebSDR sites play on some CW contacts. W4AX is my favorite. When I was first licensed fifteen meters was loaded with CW contacts every afternoon. Although I never made a lot of contacts, I did have a good bit of fun with my Argonaut 509. So some of my motivation comes from that fun. Also if one wants to make a lot of points in many of the contests CW proficiency is necessary. My last real CW contacts, two, were back in Tennessee about five years ago. I did make one contact for the 2012 CW November Sweepstakes. I listened to one slower station for a while getting his information. Then I called him and gave him my information. Fortunately I was able to copy him asking for a repeat. I was running five watts from the truck with a Hamstick. I did try doing this again yesterday for the ARRL CW DX contest, but could not find anyone slow enough to copy from the truck. Last week I connected a straight key and put it on the seat of the truck. On the way home I started calling CQ on fifteen meters running ten watts. After about five calls a station near Houston, Texas responded. Thankfully he was sending as slowly as I was sending, about five words per minute. I have had several contacts in years past where I started the contact around ten words per minute and as the conversation continued the other station sped up and I missed most of the end of the conversation. I figured I could always pull over to the side of the road, but since I was driving I did not want to push the speed. Amazingly I only missed the last comment perhaps due to traffic. I was just entering St Cloud as we ended the conversation. I was pretty happy during and after the contact. It reminded me of my first CW contact. It was a lot of fun. Unfortunately I can not use CW from home with the set up over the internet so for now I must continue to operate mobile or portable. I am looking forward to many more contacts and improving my code speed. November Sweepstakes has come and gone. I did actually make one CW contact this last time. For the phone contest I made 131 contacts. The map will be posted below. 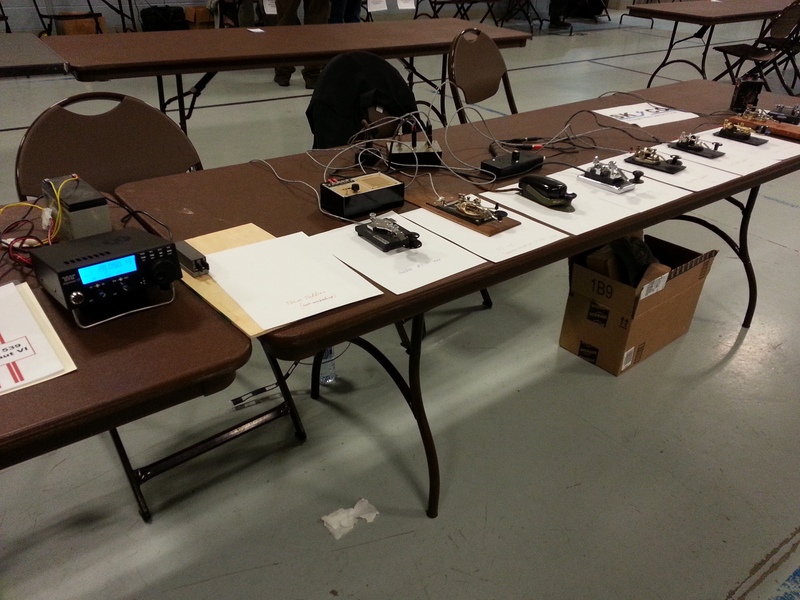 This last weekend was the January North American QSO Party, NAQP SSB. It is a fun 10 hour contest in a 12 hour period. The object is to contact as many stations in Canada and the US as possible. Stations can be worked on each HF band and each state or province counts as a new multiplier for each new band. Unfortunately I was called into work after the first two hours of the contest due to high winds and power outages. The connection to the radio equipment was intermittent during that time and the audio cut out more than normal through out the rest of the contest. I was able to work 165 contacts and still had a good time. The map for NAQP is also posted below. Still hoping for a clean sweep someday.